SOS Children’s Villages links young people with mentors to provide career advice, vocational training, and encouragement. More than 70 million young people worldwide are looking for work in increasingly complex and ever-changing labor markets. Young people without adequate parental care are particularly disadvantaged as they lack the networks and support that families often provide to support the first steps from school to the working world. To address this challenge, in 2017 SOS Children’s Villages launched the YouthCan! initiative, to boost access to training, mentoring and professional development opportunities. YouthCan! also offers the possibility of using a digital platform, called YouthLinks, giving young people the chance to connect online with their mentors from all over the world. Job mentorship programs are beneficial for young people as they start their professional lives, particularly young people without adequate parental care, as they may lack the resources and networks that their peers have. However, sometimes mentorship programs face challenges due to limited time of mentors or geographical distance between mentor and mentee. To address these challenges, a new program was piloted between June and October 2018 – YouthLinks online mentoring. 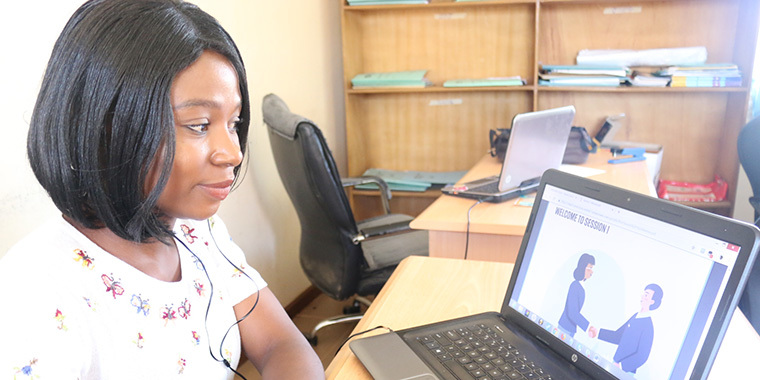 Developed together with Volunteer Vision and Aflatoun, the program has offered virtual mentoring to 63 young people leaving the care of SOS Children’s Villages in Nigeria and Peru, so they can build their employability skills. How to communicate in a work context. The training helped participants to develop professional and life skills that support their transition to a professional environment. “My mentor has helped me to identify that I am responsible and perseverant, to recognize my strengths and to be more self-confident,” says Luis Rojas from Peru, who was mentored by Antonio Delgado from Johnson & Johnson. The YouthLinks program not only gives participants a chance to boost their employability skills, but also their overall development. 92% of mentees reported that they have notably increased their self-esteem, 89% better understand which of their skills are important for their career, and 86% reported that, thanks to this mentorship, they know how to set their goals and how to achieve them. Further, 95% of participants expressed that their confidence in job interviews was significantly increased. This increase encompasses feeling greater confidence in looking for a job, preparing and presenting themselves in a job interview and finally, knowing how to properly follow up after it. “Before I did not prepare myself, I put on any clothes, it made me nervous, I did not know what to say. Instead my mentor taught me the frequent questions and that the interviewers pay attention to the movements that one makes,” said Maria Goretta, a participant from Peru. After participating in YouthLinks online mentoring pilot, young people showed great satisfaction with the learning material and the level of support received from their mentors and supervisors, and would participate in the mentorship program again, 90% of them recommending it. “It has enabled me to discover a better version of myself, and because of the confidence and knowledge acquired during the YouthLinks mentoring program, I was able to perform excellently when a job opportunity presented itself,” said Gofor Nenleritmwa David of Nigeria. One key part of this initiative was the involvement of employees of the corporate partners who volunteered their time and acted as mentors to the young people. The program met the expectations of volunteers: they felt that the program helps and supports young people, while also providing them, the mentors, with the experience and personal development they were expecting. “I hope I could show a bit that even when life is challenging, you need to see the opportunities in it. And that one should see challenging times as a gift to grow,” said Katja Oristanio, an Allianz employee who mentored young people in Nigeria.